The proposed wall slices through areas of seven major conservation areas, including Big Bend National Park and the Lower Rio Grande Valley National Wildlife Refuge. In some areas, the Trump administration has already begun construction; in 2017, the Texas Observer reported construction workers had entered the National Butterfly Center’s private land to begin clearing the way for the wall. Building the wall would destroy existing flora and fauna and disrupt wildlife, say the letter’s signees, which include high-profile environmental groups like the National Audubon Society, Greenpeace, the Natural Resources Defense Council, the Center for Biological Diversity, and dozens of birding groups. Any barrier for humans is also a barrier for animals, like the area’s snakes, tortoises, bears, sheep, and mountain lions, which currently roam freely across borders. Even birds, which can theoretically fly over the wall, may be reticent to approach an unfamiliar obstacle. The letter cites a 2016 U.S. Fish and Wildlife Service’s analysis, which found that more than 100 endangered species could be affected, and notes that the Lower Rio Grande Valley area, in particular, is thought to have the most diverse butterfly and bird fauna in the U.S.
“Barriers like border walls can interfere with the ability of animals to meet their daily needs, make seasonal migrations or disperse to new areas,” National Wildlife Federation chief scientist Bruce Stein says in the letter. He also points out that as climate change progresses, animals may need to move to adapt to warming temperatures, and the wall could impede that movement. 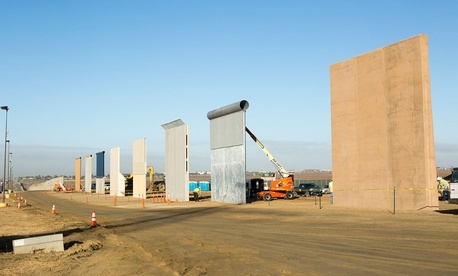 Besides the wall itself, the administration will also need to build levees in areas where the wall borders the Rio Grande, as well as roads for construction access. Additionally, the walls will be outfitted with cameras and lights, which could disrupt and confuse wildlife. If doing it for nature isn’t enough, the signees also point out the economic impact of destroying the local ecosystem: nature tourism contributes $463 million to the Texas economy annually. While that’s a small number compared to the state as a whole, which pulls in over a trillion dollars annually, damaging wildlife could also disrupt the business associated with visitors to local lands and preserves. The letter notes that birding, in particular, is huge in Texas, which explains the strong representation from birding groups in the signee list. The letter calls for the Trump administration to stop building in areas that affect wildlife, and to withdraw the waivers that made it possible for wall construction to circumvent compliance with environmental laws. Last month, one of the letters’ signees, the Center for Biological Diversity, was among three environmental groups that sued secretary Nielsen and the Department of Homeland Security for waiving those laws to expedite wall construction.